As the most recent country my family has lived in, Thailand might be my favorite. The friendly culture and love of fun is enticing and always provides you with plenty to do. Here are some of my favorite places to go in this beautiful country. Have you ever had a dish of Pàt Tai? If so, you know it combines familiar flavors with flavors known to be more exotic. This is much like the city of Bangkok. There are many familiar things to do in this city such as the weekend markets and the buzzing neighborhood of Banglamphu. But what is featured in these everyday places are exotic experiences with both the foods you try and the people you meet. 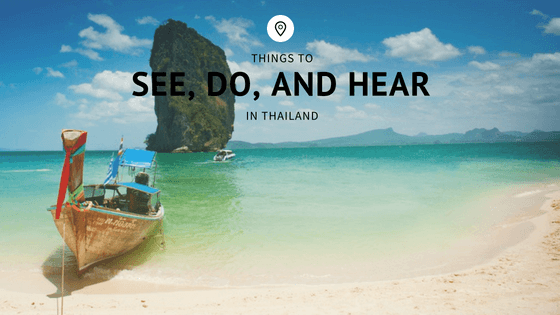 The images that come to mind when you think of Thailand are the fairytale longtail boats in an ocean with waters as blue as turquoise and white sandy beaches, right? The specific place you’re thinking of is Railay (known by the locals a Rai Leh). Boating and suntanning on the beach aren’t the only activities of this location, there are also great hiking trails and rock climbing destinations to explore. This historical park contains the ruins from hundreds of years ago. Within the Sukhothai Historical Park, you’ll find four ponds with large, old walls along the perimeter and twenty-one historical sites across a 5km radius. You can sign up for a guided tour through the western, central, and northern zones, or take a solitude exploration yourself. Rent a motorcycle or bicycle to see the even more impressive ruins located just outside the city walls. The Erawan National Park is one of the most beautiful parks I have ever witnessed. There are seven tiers of waterfalls that tumble through the forest and create beautifully blue pools at their base. The first three tiers of falls are easy to reach but beyond that, you’ll need more proper hiking gear. Bring your swimsuit but be aware of the creatures you’ll meet deep in the jungle. The fish have been known to nibble on some swimmers and monkeys may steal some of your belongings if you’re not careful.